Pain in the jaw can greatly affect your life. The pain can hinder your ability to chew, swallow and speak. The constant, throbbing pain can make everyday life miserable. Well, there are many possible culprits. Regardless of the cause, it is important to have your jaw examined as soon as possible by one of our dental specialists. Waiting for treatment can prolong your discomfort and may even cause the pain to worsen. 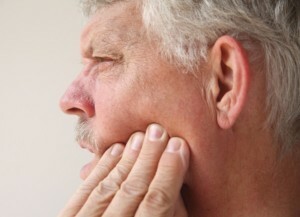 Temporomandibular joint disorder is a common source of jaw pain that affects many patients. The joints that cause TMJ pain are located along the hinge joint between the upper and lower jaws on either side of the mouth. The jaw hinge joint can emit pain that is caused by overuse or stimulation of the jaw joint, injury to the jaw joint, injury or strain of the muscles that control the movement of the jaw hinge, arthritis of the padding of the jaw joint and displacement of the cushioned disc of the jaw joint. TMJ can be caused by excessive grinding of the teeth, clenching of the jaw and trauma to the jaw joints. Certain headaches such as migraines and cluster headaches can emit pain and pressure that radiates from the forehead, temple and behind the eyes to the jaw. Believe it or not, your mouth is connected to your sinuses. When sinuses get infected with germs or get congested with excessive mucus, pressure and pain can radiate to the jaws, causing discomfort. The infection of a pulp or roots of a tooth or teeth can spread into the jaw. Decay and infection are common causes of these painful tooth roots and pulp infections. Pain from tooth sensitivity caused by decay can also penetrate the gums and jaws. Surprisingly, jaw pain can be a symptom of a heart attack. When one thinks of heart attack symptoms, chest pain, pain in the neck, legs, arms and face may come to mind. Jaw pain on the left side, particularly in women, can indicate a heart attack. This re-emphasizes the importance of getting your jaw pain promptly looked at. In addition to jaw pain, other common symptoms of a heart attack include: faintness, sweating, shortness of breath, chest tightness, nausea and excessive sweating. Injury to the jaw can strain, hyperextend or pull muscles that control the movement of the jaws, a dislocation of the jaw, and fractures and breaks in the bone of the jaw can cause pain, stiffness and discomfort. Jaw pain isn’t natural and indicates injury. A painful jaw can have negative impacts on one’s daily life, making it hard to do routine actions such as eating and speaking. It is important to have your jaw pain examined, diagnosed and treated by one of our dental professionals as soon as possible to keep the pain from worsening and to get back to living your life pain-free. There are many causes of jaw pain and our dentists may be able to examine and treat your discomfort and pain. Contact us today if you’re experiencing jaw pain.